It’s almost time for the holidays! While you’re enjoying things like time off from work, family gatherings, peppermint mochas, gifts, meals and everything else December-related, we’d just like to borrow a second of your time to remind you about how the holidays affect your pets, too. Don’t give pets table scraps. Giving animals people food can severely disrupt their internal system and can lead to diarrhea, vomiting, severe weight gain and more. Keep holiday presents away from invasive snouts. Curious pets can get through almost any form of packaging and may easily access those yummy chocolates and other holiday treats. Avoid bringing toxic plants to your house. Common holiday plants like poinsettias and mistletoe can cause misery to pets if they ingest them, so be extra careful. For a full list of good plants and bad plants, check out the ASPCA’s handy guide here. Make sure tree decorations are out of paw’s reach. Tinsel, ornaments and lights are all bad news bears if your pet gets their chompers on them. 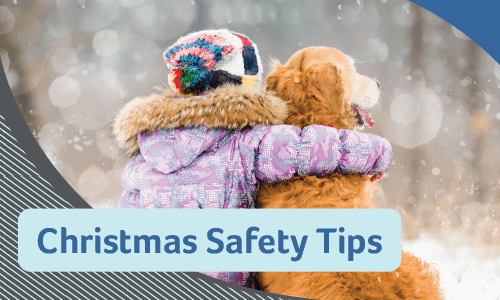 Tinsel can cause intestinal blockage, chewed lights can shock pets and sharp ornaments can easily injure anyone, man or beast. A good idea is to place a pet-proof barrier around your holiday tree. Watch those spirits and libations. Alcohol is not good for pets! Absolutely keep these beverages high and away from any nosy muzzles. Provide a pet sanctuary during times of merriment. If you’re having a holiday gathering then the loud noises, laughter and abundance of guests may make your pet anxious. Prepare a safe place for them complete with bedding, toys, treats, water and a litter box for those kitty cats. Since you’re a fabulous and responsible pet owner, we know you’ll take these tips to heart. At Glendale Animal Hospital, we just wanted to give you a gentle nudge and a reminder that preparing for the festivities means getting your animal companion prepared as well! If you have any questions on any of the above scenarios, please do not hesitate to give us a call at 630-297-4709. Thank you and have a happy holiday season!